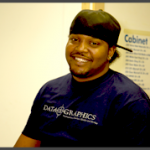 Your One Stop for Custom Labels that Make a Statement | Data Graphics Inc. Your One Stop for Custom Labels that Make a Statement | Data Graphics Inc.
Data Graphics is your one-stop source for quality nameplates, graphic overlays and custom labels. We have been in business for over 30 years and use state-of-the-art technology, software and printers for all of our custom sticker printing and labeling orders. We produce all our labels in house to save you time and money. We pride ourselves on the affordability, timeliness and exceptional customer service that made us industry leaders. 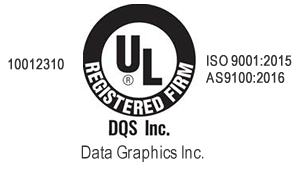 Data Graphics is an authorized label supplier with Underwriters Laboratory (UL). We have also been assessed and approved by UL-DQS against the provisions of AS9100 Revision C and ISO 9001:2008. Our custom adhesive labels are also widely used to provide unique identification (UIDs) in the form of barcode labels for inventory purposes and as a way to aid loss-prevention efforts. 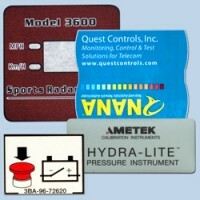 In fact, custom labels are required by contractors supplying the United States Department of Defense to discourage unauthorized repairs or alterations to machinery and computers. Our warranty labels include tamper-resistant labels that will reveal any attempted access to the inner workings of products. Our 25,000-square-foot production facility can produce custom stickers, labels and nameplates in all the materials you need. We stock a wide variety of label materials to offer a label solution for any challenge. We then leverage advanced printing technology and techniques that big-name, Fortune 500 customers trust. Labels don’t do any good if they become detached or illegible. Some of our customers’ products have to perform in the most demanding working environments. If your product has to withstand heat or cold extremes, saltwater, corrosive chemicals, abrasions, repeated impacts or the fading effects of ultraviolet radiation exposure, reach out to us for a quote. Our in-house specialists are standing by to give you the best solution to your custom label needs.